"Aqueous" redirects here. For the fluid in the eye, see Aqueous humour. The first solvation shell of a sodium ion dissolved in water. An aqueous solution is a solution in which the solvent is water. It is mostly shown in chemical equations by appending (aq) to the relevant chemical formula. 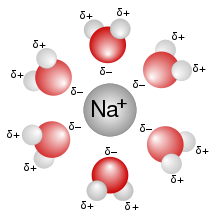 For example, a solution of table salt, or sodium chloride (NaCl), in water would be represented as Na+(aq) + Cl−(aq). The word aqueous (comes from aqua) means pertaining to, related to, similar to, or dissolved in, water. As water is an excellent solvent and is also naturally abundant, it is a ubiquitous solvent in chemistry. Aqueous solution is water with a pH of 7.0 where the hydrogen ions (H+) and hydroxide ions (OH-) are in Arrhenius balance (10-7). ^ "Solutions". Washington University Chemistry Department. Washington University. Retrieved 13 April 2018.